Email: akalia (at) trebnet.com . Your Real Estate Sales Rep. for Life! Working With the Broker who is servicing the community since 17 years.....You gotta meet him... Services to Buyers * Lowest Interest Rates Available! * New Listings Brought to Your Attention First! 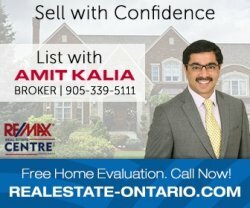 Woodbridge: Vimal Patel - Realtor - Homelife RoyalCorp Real Estate Inc.
Toronto: Homelife Royalcorp Real Estate Inc.